Dr. Jess H. Mullens joined Bienville Orthopaedics in August of 2018. Dr. Mullens received his Bachelor of Science in Biology from Berry College in Rome, GA where he played basketball. After obtaining his Doctor of Medicine from the University of Alabama School of Medicine in Birmingham, Dr. Mullens went on to complete his Orthopaedic Surgery Residency at the University of South Alabama in Mobile. He then completed his fellowship training in Foot and Ankle at The Steadman Clinic in Vail, CO where he served as a Team Physician for the US Ski and Snowboard teams. 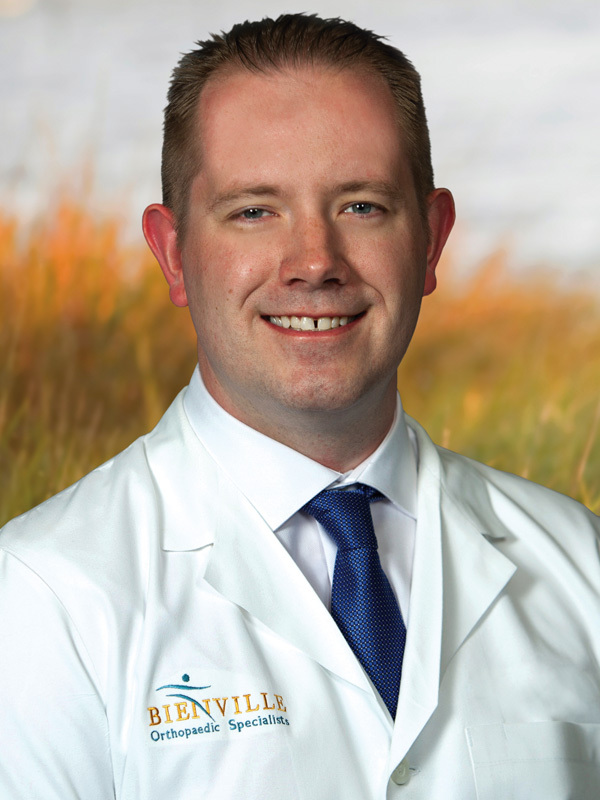 A member of the American Orthopaedic Foot and Ankle Society, Dr. Mullens’s clinical interests include sports ligament and tendon repair, ankle arthroscopy, ankle replacement, treatment of foot and ankle arthritis, and foot and ankle trauma. Dr. Mullens and his wife, Brittany, are excited to be living on the Mississippi Gulf Coast. Dislocated Posterior Tibial Tendon Treated with Plate Buttress Fixation in a Collegiate Gymnast: A Case Report and Review of the Literature. Mullens J, Whiteside W, Nilssen E, Kennedy C. Foot and Ankle Specialist. 2015. The Joint Moment Distributions of the Lower Extremity during Gait in Patients after Open Reduction and Internal Fixation of Acetabular Fractures. Alabama Orthopedic Society Annual Meeting. April 2015. Destin, FL. The Joint Moment Distributions of the Lower Extremity during Gait in Patients after Open Reduction and Internal Fixation of Acetabular Fractures, Directed by Dr. Jorge Alonso, University of South Alabama Department of Orthopaedic Surgery. 2015. Risk Factors for Readmission Following Reverse and Total Shoulder Arthroplasty, Directed by Dr. Albert Pearsall, University of South Alabama Department of Orthopaedic Surgery. 2014. Operative Reports: Milestones to Teaching Orthopaedic Surgery Residents, Directed by Dr. Brent Ponce, University of Alabama – Birmingham Department of Orthopaedic Surgery. 2011. Accuracy Assessment of Reported Residency Work Hours: A Pilot Validation Study, Directed by Dr. Steven Theiss and Dr. Brent Ponce, University of Alabama – Birmingham Department of Orthopaedic Surgery. 2011. Osteoporotic Distal Femur Fractures Treated with Modular Oncologic Distal Femoral Replacement, Directed by Dr. Herrick Siegel, University of Alabama – Birmingham Department of Orthopaedic Surgery. 2011. Case Report: Bone Cement Implantation Syndrome with Reverse Total Shoulder Arthroplasty, Directed by Dr. Brent Ponce, University of Alabama – Birmingham Department of Orthopaedic Surgery. 2011. National Cancer Center Research Institute, Seoul, South Korea. Research Assistant. Six week internship working under Director Dr. In-Hoo Kim. Duties included observing research on validating a new tumor-targeting gene therapy; attending surgeries; revising and editing English website. 2006. Total Hip Arthroplasty Instability, University of South Alabama Department of Orthopaedic Surgery Lecture Series, June 2016. Knee Cartilage Defect Management. University of South Alabama Department of Orthopaedic Surgery Lecture Series. February 2016. Hip Hemiarthroplasty and Resurfacing. University of South Alabama Department of Orthopaedic Surgery Lecture Series. December 2015. Primary Osteogenic Tumors. University of South Alabama Department of Orthopedic Surgery Lecture Series. October 2015. Casting and Splinting Orthopedic Injuries. University of South Alabama Department of Orthopaedic Surgery Lecture Series. July 2015. Hand Fractures and Ligament Injuries. University of South Alabama Department of Orthopaedic Surgery Lecture Series. June 2015. Shoulder Reconstruction. University of South Alabama Department of Orthopaedic Surgery Lecture Series. May 2015. The Joint Moment Distribution of the Lower Extremity during Gait in Patients after Open Reduction and Internal Fixation of Acetabular Fractures. University of South Alabama Department of Orthopaedic Surgery Grand Rounds. April 2015. Thoracolumbar Spinal Pathology. University of South Alabama Department of Orthopaedic Surgery Lecture Series. March 2015. Elbow Fractures. University of South Alabama Department of Orthopaedic Surgery Lecture Series. January 2015. Acetabular Fractures. University of South Alabama Department of Orthopaedic Surgery Lecture Series. November 2014. Osteosarcoma and Chondrosarcoma. University of South Alabama Department of Orthopaedic Surgery Lecture Series. October 2014. Leg, Ankle, Foot Anatomical Dissection and Approaches. University of South Alabama Department of Orthopaedic Surgery Lecture Series. August 2014. Femur and Knee Anatomical Dissection and Approaches. University of South Alabama Department of Orthopaedic Surgery Lecture Series. August 2014. Pelvis and Hip Anatomical Dissection and Approaches. University of South Alabama Department of Orthopaedic Surgery Lecture Series. August 2014. Forearm and Hand Anatomical Dissection and Approaches. University of South Alabama Department of Orthopaedic Surgery Lecture Series. July 2014. Shoulder and Elbow Anatomical Dissection and Approaches. University of South Alabama Department of Orthopaedic Surgery Lecture Series. July 2014. Neck and Spine Anatomical Dissection and Approaches. University of South Alabama Department of Orthopaedic Surgery Lecture Series. July 2014. Corrosion, Biocompatibility, and Tribology. University of South Alabama Department of Orthopaedic Surgery Lecture Series. May 2014. Nerve, Muscle, and Tendon Basic Science. University of South Alabama Department of Orthopaedic Surgery Lecture Series. April 2014. Vascular and Neural Lesions. University of South Alabama Department of Orthopaedic Surgery Department Series. February 2014. Osteomyelitis and Septic Arthritis. University of South Alabama Department of Orthopaedic Surgery Lecture Series. October 2013. Connective Tissue Disorders. University of South Alabama Department of Orthopaedic Surgery Lecture Series. September 2013. Bone Metabolism. University of South Alabama Department of Orthopaedic Surgery Lecture Series. August 2013. Leg, Ankle, Foot Anatomical Dissection and Surgical Anatomy. University of South Alabama Department of Orthopaedic Surgery Lecture Series. August 2013. Femur and Knee Anatomical Dissection and Surgical Anatomy. University of South Alabama Department of Orthopaedic Surgery Lecture Series. August 2013. Pelvis and Hip Anatomical Dissection and Surgical Anatomy. University of South Alabama Department of Orthopaedic Surgery Lecture Series. August 2013. Forearm and Hand Anatomical Dissection and Surgical Anatomy. University of South Alabama Department of Orthopaedic Surgery Lecture Series. July 2013. Shoulder and Elbow Anatomical Dissection and Surgical Anatomy. University of South Alabama Department of Orthopaedic Surgery Lecture Series. July 2013. Neck and Spine Anatomical Dissection and Surgical Anatomy. University of South Alabama Department of Orthopaedic Surgery Lecture Series. July 2013. Academic Excellence Award, University of South Alabama Department of Orthopaedic Surgery, June 2016. Second Runner-Up for Presentation of “The Joint Moment Distributions of the Lower Extremity during Gait in Patients after Open Reduction and Internal Fixation of Acetabular Fractures”, Louis D. Anderson Society Conference, July 2015. Resident Scholar, American Orthopaedic Foot and Ankle Society. July 2015, Long Beach, CA. The Dean’s Award. University of Alabama School of Medicine, Huntsville Regional Campus. Presented to the student with the highest academic performance in the clinical clerkships. May 2012. Charles Selah Surgery Award. University of Alabama School of Medicine, Huntsville Regional Campus. Presented to the student with the highest academic performance in the surgery clerkship. May 2012. Alpha Omega Alpha, University of Alabama School of Medicine Chapter. 2011. McGraw-Hill/LANGE Study Award. Awarded annually to two second-year students of each UAB regional campus with the highest overall GPA. 2009. Walter O. Pendley, M.D. Award. Awarded annually to a Berry College “Rising Senior Showing Greatest Promise in the field of Medicine.” 2007. A.O. Duer Award, NAIA, Region XIII Recipient and Southern States Athletic Conference (SSAC) Recipient. Recognizes scholarship, character, and citizenship by junior student-athletes in any sport. 2006. Emil S. Liston Award, NAIA Region XIII Recipient and SSAC Recipient. Recognizes academic and athletic excellence by junior student-athletes in men’s and women’s basketball. 2006. SSAC All-Academic team. Awarded to sophomore, junior, and senior athletes. 2005 – 2008. Dr. Mullens sees patients at our East Lake Office. Bienville Surgery Center was created with the needs of the community in mind and is dedicated to providing the highest quality care possible, with excellence in cutting-edge orthopaedic procedures such as outpatient total joint surgery as well as certain hand, back, shoulder, and sports injury interventions. To learn more about our outpatient surgical services, please visit our Bienville Surgery Center website.